While SHAMOS is serious astronomy, it is PRACTICAL ASTRONOMY or positional astronomy or even more correctly SPHERICAL ASTRONOMY. In an age when most of what we hear or read about astronomy is realy astro-physics, planetology or rockety and space craft, practical astronomy harks back to an almost bygone age when technology was just beginning to calculate with reliable accuracy and predicability the positions of celestial objects. Nowadays for most people who are not professional astronomers the field of SHERICAL ASTRONOMY is almost completely unheard of. Therefore SHAMOS, which requires of the user some understanding of coordiante systems, is more suitable to the technically oriented. Nevertheless the amount of technical/mathematical knowledge is limited to just a few funddamentals. With this limited knowledge SHAMOS becomes a useful tool for astronomy. For instance while their are many other programs for astronomy and much showier on the computer screen, SHAMOS is a program takes into account the horizon. Therefore in some locations for small observatories and many serious amature astronomers SHAMOS offers the ability to know when a celestial object comes over the horizon that is unique to observers location where the unique place of observation is defined not by just latitude and longitude but its local horizon. 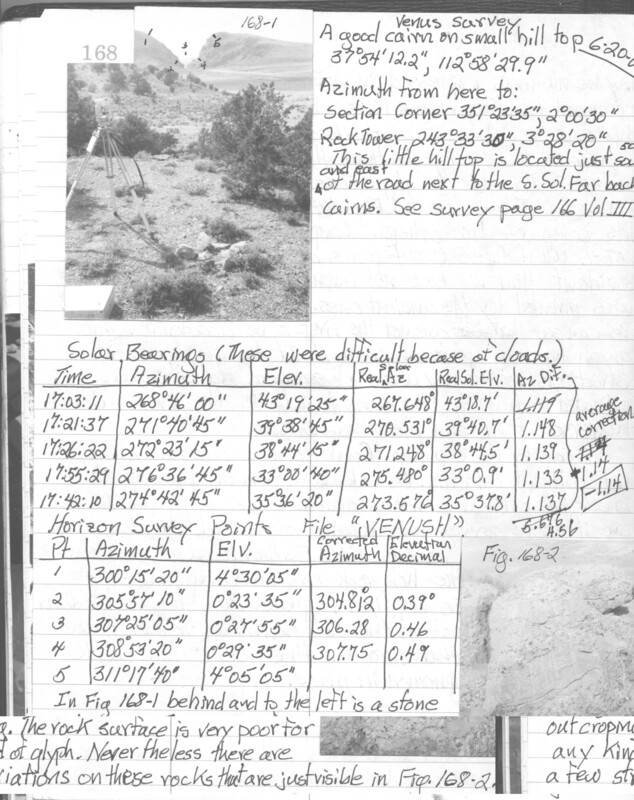 To illustrate, in the first box above is a page from the Parowan Gap field notes. Next to transit tripod is a small cairn situated on top of a small hillock. The gap narrows is clearly visible off to the west. With the transit set up in this position five solar bearings are taken. The sun's position as measured by the transit is compared to the sun's position as calculated by SHAMOS. The differences are averaged to arrive at a correction to be added to any measurements taken with that setup of the transit. Then the area around the gap narrows was mesured in azimuth and elevation pairs. The azimuths of these pairs were corrected with average corriction calculated from the solar bearings, -1.14 degrees. SHAMOS was then told to determine the northernmost setting of Venus over the eight year Venus cycle. 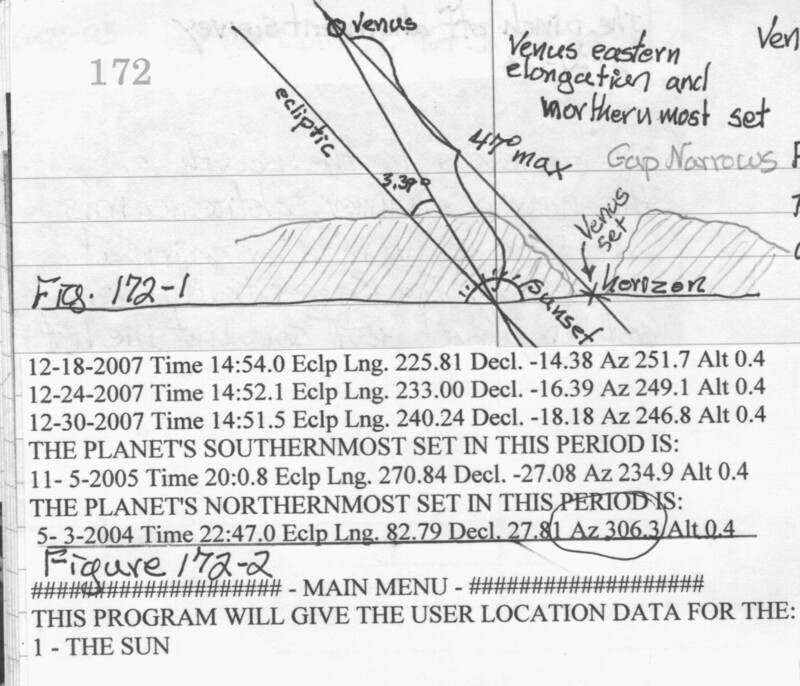 From this vantage point the center of the gap narrows was found to be at azimuth 306.28 degrees while SHAMOS found that the northernmost set of Venus at the Gap was going to be 306.3 degrees on May 3, 2004 at 22:47. A small team of people were there to watch this Venus setting on that date and the event took place precisely as predicted. 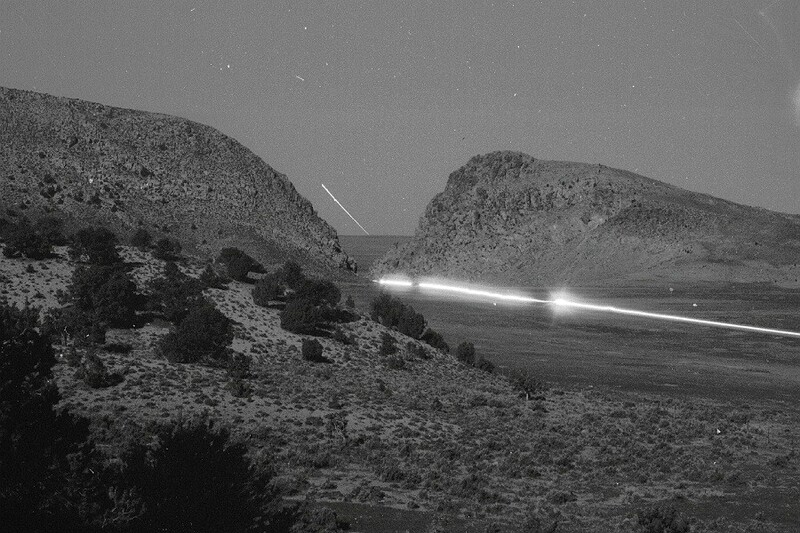 We knew that this event was not coming back for eight years so to be sure to capture the Venus setting in the Gap Narrows a duel approach, digital and chemical photography, was used to assure success. Ron Lee use his digital camera to take successive exposure as Venus approached the narrows and set. Digital photography is very good at dealing with low light exposures while chemical photography is good to take long time exposure to capture the path of Venus through the night sky. For the digital pictures the camera itself was good to calculate its own exposure. For the silver halide photography exposure was tricky. There is a little problem called reciprocity failure. This means that for a very long exposure of an hour or more, the normal reciprocity between exposure time and the lens openning does not apply. 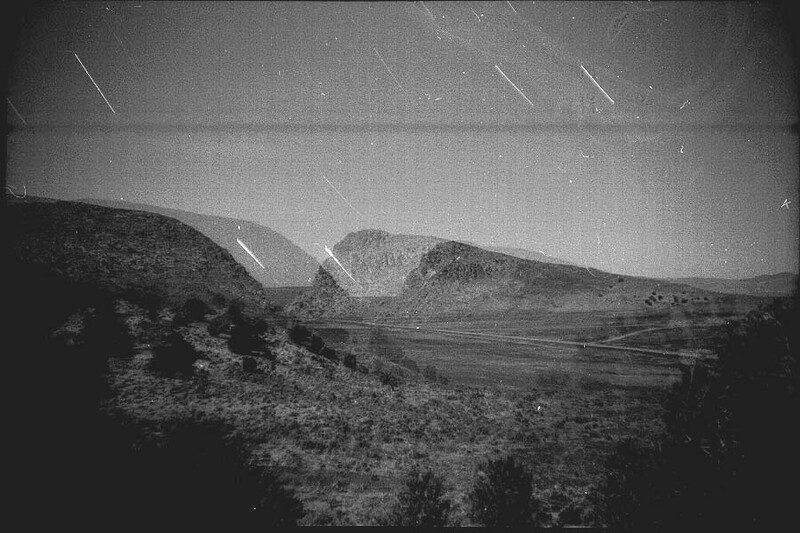 Having no information to precisely calculate the exposure, Nal Morris used eight antique cameras over three nights while Venus was passing through its maximum north setting. The eight cameras could be set open for different time exposures and at different f-stops. Of the 24 exposures taken with this method only five gave usable images, which to my great relief is good enough. The moon was full or nearly full for all three nights of the exercise. An hour exposure in full moon light would turn the negative black in normal development. After much thought and research of the problem, I noticed that HC110 developer can be mixed at Dilusion F. This dilusion is so thin I surmised that development would procede very slowly and some of the f-stops ranging between F22 and F5.6 would have to find the correct development. The first photo below is the best of the negatives deveoped. The landscape of the Gap Narrows stands out in the full moonlight. The trees cast distinct shadows and the whole scene has a surreal aura mysterious irredecence. The track of Venus setting in narrows is clearly visible but fads at she passes into the denser attmosphere just before setting on the distant horzon. However if you extend the trace of Venus to the horizon, you can see that she set just right at the center between the narrows just as SHAMOS had predicted. The smaller picture is special. One of the cameras being a very old antique did not advance the film correctly and I ended up with a double exposure where the the two images of the scene occurs twice just offset from each other. It made an interesting effect. The third photo has the trace of car headlights. When a car drove through the narrows it was impossible to shade all the cameras while it passed through the priture. This illustration was taken from hundreds of site write ups to illustrate how SHAMOS is used to determine rises or sets of any celestial object whose coordinates are know. While this is not heavy deep space astronomy it may nevetheless be useful to amature and professional astronomers. The setting of Venus in the gap narrows was a specular example of SHAMOS's capability of prediction. It took into account the local horizon with respect to the near and far topography and the time was predicted to the minute. Parowan Gap DOES IT YET AGAIN! With the observation of the Eight Year Venus Cycle we add to a long list of celestial events observable at the Parowan Gap. Before the Venus set all of the observable events at the Gap have been solar. However with the coming of 2004 and 2005 we have arived at two events that extend beyond the yearly events of the sun and can now watch the extended cycles of the moon. 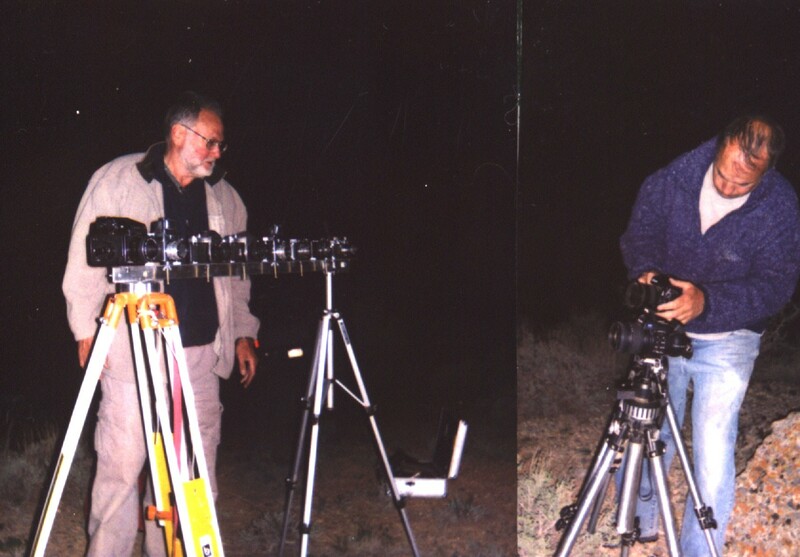 We have been working with the Gap for more than eight years so it would have been possible to observe Venus at its northernmost setting in May of 1997. The principle reason this didn't happen was the lack of a clear Venus glyph in the library of glyphs found at the narrows. This would have been the justification for a greater Venus alignment search. 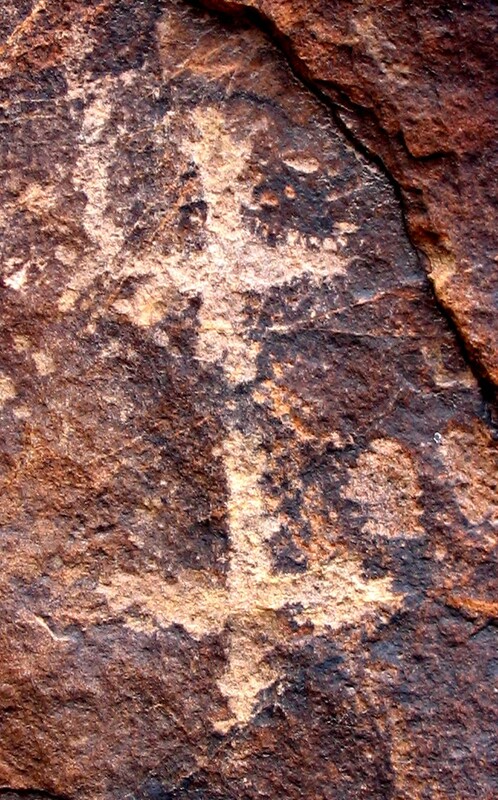 However as Nal Morris went deeper into Venus research and understood better the doubly inclosed Venus cross found in Maya regions in Meso-America and working its way north in Arizona and Nevada, it became clear that the glyph to the right is a varient of the doubly inclosed Venus cross. At that point it became consistant with the other discoveries at this site to see what Venus was doing in this archaeological setting. On the very day of summer solstice this year, June 21, 2005, the moon will come up in the metonic slot at the Gap narrows. 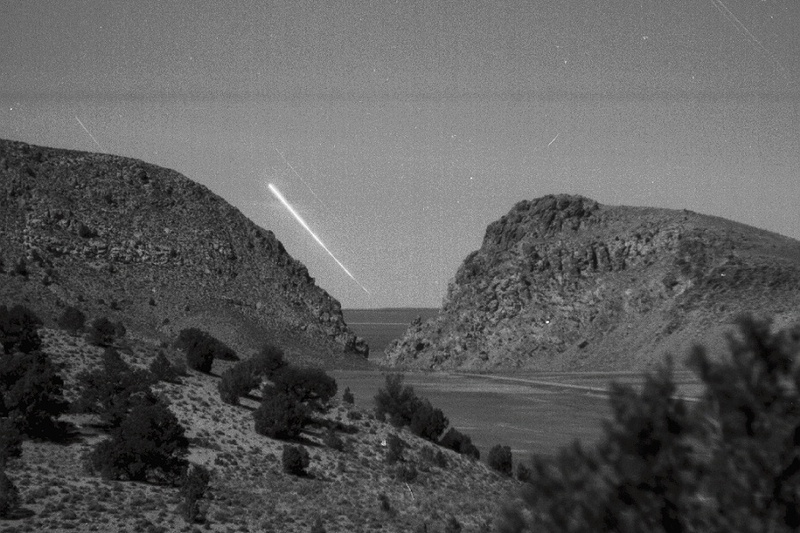 At this we will have observed the long cycles presently found at Parowan Gap. More information can be found in Volumes I and II of the Parowan Gap Report available from Solarnetics.